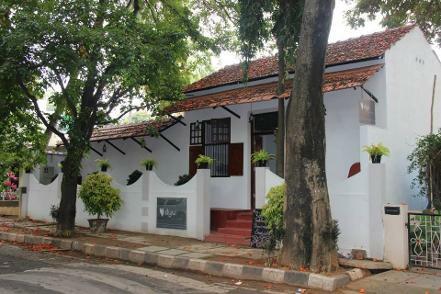 Dyu Art Cafe, located in Koramangala, the heart of the Garden City of India, aims to be the premier space dedicated to quality art, food and beverages. We are dedicated towards creating an atmosphere that is vibrant yet minimal, exciting yet relaxing; a place where coffee and creativity meet. Keeping the pleasant Bangalore weather in mind, we have created a wonderfully relaxing and spacious environment; an antidote to the hustle and bustle of the streets of Koramangala. With some of the most prolific names in the art world exhibiting their works at Dyu, you can be rest assured to get inspired! Our food is all made with natural, fresh ingredients. We believe in sustainability and protecting the environment, with use of eco-friendly materials, right from our coffee grinders to the bottles we use to serve you water. Our endeavor is to make you feel right at home. So if it's comfort you seek, you've come to the right place! "The Banofie Pie - the stuff legends are made of, really good pie ! " "Come here for a date or bring in your family for a snack time or just come here sit back relax have tea, read your book and enjoy the dessert. " "All u need is a peaceful place to relax and Dyu art cafe gives u all."